Ekawati Liu invited me to come out to Sleman, where she was doing her research into the livelihood choices of Indonesian villagers with disabilities to document a theater workshop. The performance took place on a makeshift open-air stage using only the simplest of props, in the pendhopo attached to the sub-district office in Berbah, Sleman, on the outskirts of the city of Jogja. The performers were mostly amateurs with limited experience who had come together less than a week previously to develop the concept for the play, to create a scenario, and to practice the skills required to convey their story. The performance itself worked because of the sincerity of the performers. They weren’t really acting, they were playing their own stories. But to me, the most interesting thing was the process by which they put the performance together. The performance took place on a makeshift open-air stage using only the simplest of props, in the pendhopo attached to the sub-district office in Berbah, Sleman, on the outskirts of the city of Jogja. The performers were mostly amateurs with limited experience who had come together less than a week previously to develop the concept for the play, to create a scenario, and to practice the skills required to convey their story. They were an extremely diverse group, including teachers, traders, activists, housewives and unemployed dependents, with widely varying backgrounds, characters, needs and aspirations. 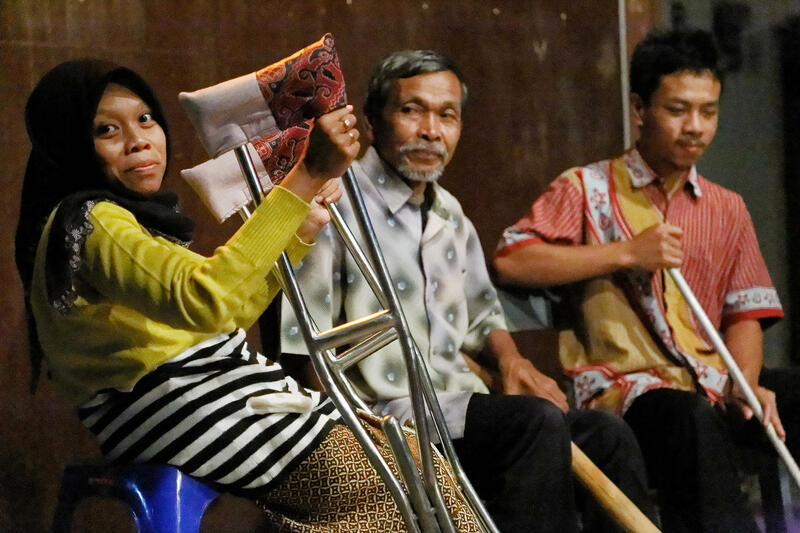 Prior to preparing for the performance, the single common denominator between them was that all of them had previously acted as informants for a work of participatory research conducted by Ekawati Liu, a PhD candidate from Deakin University in Australia, into the livelihood choices of Indonesian villagers with disabilities. Together, the group presented a performance consisting of two acts, with the first involving villagers with hearing impairments describing the difficulties they had in accessing effective hearing aids and other assistive equipment, and telling the audience how this effected their ability to participate in the life of their communities. The second act portrayed the story of a young man raising chickens who needed a loan to expand his business. When the financial institution’s field officers visited to inspect his business, they learned that he was blind. Without ever referring to his disability, the field officers found various barely plausible excuses to refuse the loan. The story of the young man whose loan was refused had no clear conclusion, and it wasn’t clear how the issue of the lack of access to hearing aids and other assistive devices was to be resolved. In effect, the discussion that followed the performance was its third act. At this point, the performance expanded to encompass the audience, which was required to participate in determining how the story would unfold, not on the stage – but in real life, in their real lives. Many in the audience had their own experiences with lack of access to the facilities they needed to participate fully in community life, and this was a chance for them to express their own frustrations and hopes. It took effort and energy for many of them to do so, with many of the audience having conditions or issues that made communication challenging. Interpreters conversant in Sign were available to ensure that those of the audience who used this language to communicate were able to participate in the forum. But everyone made the effort, and those expressing their opinion were confident that at this forum, when they spoke, they would be listened to. 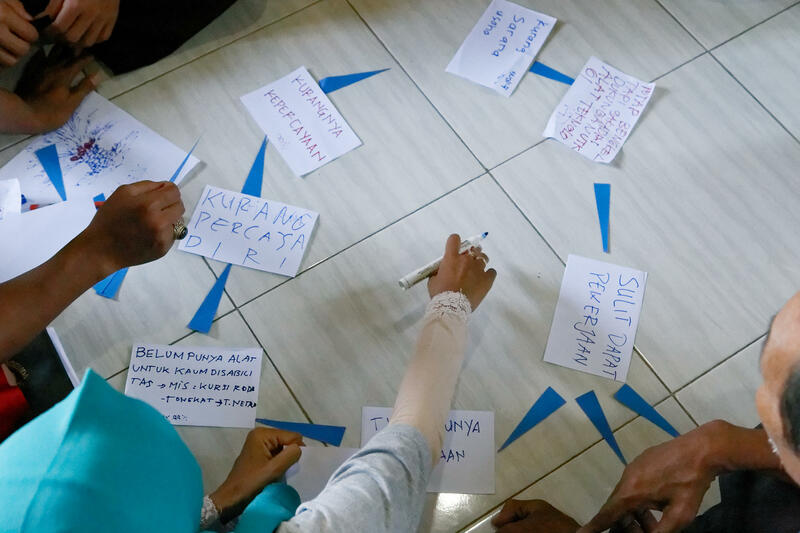 In fact, the performance and the discussion that followed was the culmination of a process by which a group of villagers with wide-ranging and diverse disabilities from the surrounding areas of Kulon Prujo and Sleman had come together to identify issues of concerns and discuss possible solutions. In the workshop that led to the performance, the process of identifying and prioritizing issues and determining how to express them was as much an end in itself as a preparation for the actual performance. To take part in the five-day workshop, the participants came together at the offices of SIGAB (Sasana Integrasi dan Advokasi Difabel, Institute for Integration and Advocacy of the Difabled), an independent non-governmental organization established in Jogja on May 5, 2003 to defend and fight for the rights of the ‘difabled’ (differently abled) throughout Indonesia and to ensure their full inclusion. The workshop was facilitated by Joned Suryatmoko, a theatre maker, playwright, community facilitator and researcher, whose role was to manage the logistics of the process and to establish a framework by which the participants could explore and express their experiences, while at the same time intervening in or guiding the actual content of the performance and the associated preparatory processes to the very least extent possible. In order for the individuals participating in the workshop to be able to produce a story that reflected their aspirations and concerns as a group, they first had to become aware of their shared interests and common concerns. This was by no means an automatic process, as each member of the group had developed their own means for dealing with their own life, and didn’t necessarily see what they had in common with the other. For example, while the fiercely independent 70-year old Mbah Muji had previously participated in village-level disabled people’s groups, he barely seemed to accept that the label ‘disabled’ applied to him. Sure, he was completely blind, but he was an active professional musician, he was able to climb trees to harvest coconuts, and he had worked as a masseur. He felt that he was able to support himself without assistance, and therefore he found it hard to accept that he was disabled. It might not have been easy for him to see what he had in common with Ibu Karyati, who had previously been hospitalized and medicated for schizophrenia and who had periods where she felt unable to interact with others or look after herself. While Mbah Muji’s rejection of the stigmatizing label ‘disabled’ reflected his strong belief that he was a full member of the community in which he lived, it might also have limited his ability to work with others who faced similar issues. For the group to perform a story that was their story, each performer had first to reflect on her or his own personal story and to become aware of how this story intersected with those of the others in the group. To facilitate this, participants were invited to engage in a brainstorming session. This involved gathering together in small groups with a range of photos and visual prompts, with the pictures and images described in detail to those who were visually impaired. The participants were invited to use these prompts to define their current economic and social circumstances, the circumstances to which they aspired, and the obstacles they faced in achieving these aspirations. Each member of the group interpreted this task in their own way. The irascible Mbah Muji at first stubbornly insisted that he didn’t have any problems (‘Mboten wonten masalah!’). Others focused on their aspirations, with one hearing impaired man stating simply ‘I want to work’ (‘Aku ingin punya pekerjaan’). Others focused on their own attitudes, their lack of belief in themselves, while Mbak Dian, an extroverted activist whose mobility had been affected by polio, stated that the problem was that other people didn’t trust in her ability to be a useful member of the community (‘Kurangnya kepercayaan’). Others focused on the practical equipment and facilities they needed, particularly assistive devices such as hearing aids and wheel chairs. Each participant wrote down a simple phrase, short sentence, or single word on a piece of paper to summarize the aspiration or constraint they had identified. In small groups, the participants discussed and explained their reasons for their choices. Shifts began to occur and the participants began to see how the ideas of other participants related to them. For example, after hearing others talk about their need for assistive devices, Mbah Muji began to talk about how a government agency had previously provided him with an assistive stick for the visually impaired, but that it had been poorly designed and that he had felt frustrated by his inability to travel further from his house as a result. Following this discussion, with the collage of printed statements expressing the wide range of ideas, hopes, and expressions of frustration, the participants were invited to try to determine the relationship between these statements, to identify cause and effect between them, to formulate a ‘problem tree.’ For example, the participants saw that ‘lack of access to assistive devices’ contributed to ‘lack of self-confidence,’ which in turn led to failure to apply for work. This linked to other people’s lack of trust in the ability of people affected by disability, which also contributed to the participants failing to apply for work or to develop businesses, because they were convinced they would be rejected. The process of drawing up these problem trees involved intense and lively discussion by which the participants became aware of how their own perceptions of their individual circumstances related to those of the others in the group. Once the relationship between each participant’s individual story and ideas with those of the others in the group became clear through the process of establishing problem trees, the next step was to create a story that expressed the relationship between these ideas. To enable the participants to create a dramatic story, the facilitators provided them with an example of a story, the story of Si Nia, a blind woman who, despite her desire for independence and autonomy, was constrained by over protective parents, who objected to her relationship with a man called Anggoro, also visually impaired. By discussing the themes in this story, the participants were able to see how the themes that they had raised when drawing up the problem trees could also be dramatized. A major theme that had emerged from the process of creating the problem tree and the surrounding discussion was that the biggest challenges the participants faced related to the beliefs of the people in their community that disabled people were unable to work or be productive, even though work and productive opportunities were exactly what the members of the group needed to address their exclusion from the community. 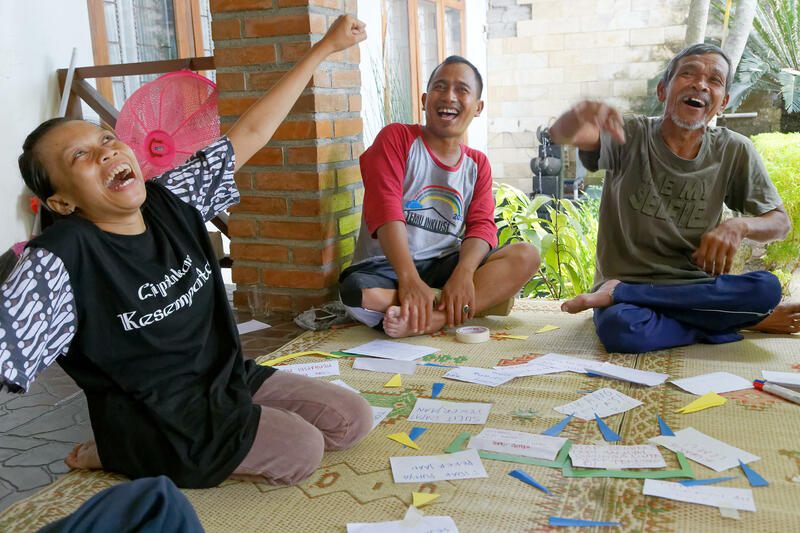 The group collectively formulated a single short sentence that summarized their frustration: ‘It’s because we are disabled that we need work!’ (Justru karena aku difabel, aku harus bekerja!’). To express this idea dramatically, the group conceived of the story of the young man raising chickens, whose inability to expand his business had nothing to do with the fact that he was blind, and everything to do with the fact that the financial institution field officers assumed that he would not be able to make a success of his business because he was blind. Interestingly, when I asked the participants if any of them had ever applied for credit themselves and had their applications rejected, they all shook their heads. They all described struggling to establish their own businesses with the limited resources that were available to them, sometimes using soft loans or small gifts of money or other resources provided by family members or members of the surrounding community, sometimes just building on the fruits of their own labor. Not a single one had ever applied for a loan from a formal institution. Dian, the bubbly and extroverted village activist, who certainly did not seem to lack self-confidence, said: ‘I think most difabled people just think there is no point applying, so we work out other ways of doing things.’ The story the group presented was not so much about what had happened to anyone in the group, but what they feared or believed would happen. Ekawati Liu’s research and the SIGAB theater workshop were funded by Indonesia’s Peduli program, through the Asia Foundation. I am involved with Centre for Independent Living which is a disability group in Ireland and read this article with great interest. There are many similarities between us and you even though many of the practical issues described in the article do not affect us so much. However, the issue of employment of people with disabilities is a real one for many of our members because many employers do not see people with disabilities as productive workers. Thank you for this article. It is really inspiring.